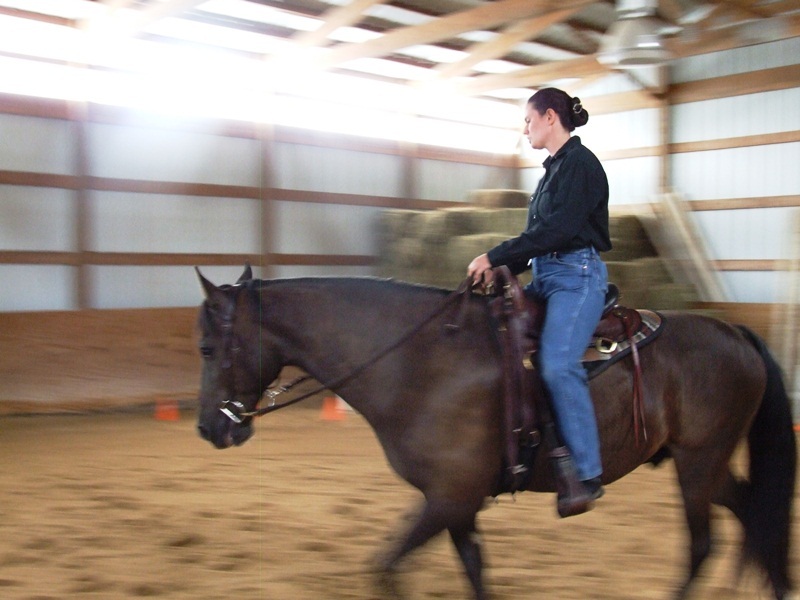 Blaze is Tennessee Walker who trots, most of the time, rather than gaits. This horse’s trot is very bumpy and we really would like to see him gaiting. I rode him in a the same tack the owner rides with. I rode him in a plain snaffle. I began the training with teaching Blaze to relax and give his nose. I do using a circling exercise that helps them understand to give their nose and relax their neck and later their back. He very quickly got the idea of this and we moved on to helping him gait. First I got him walking slowly and relaxed. Then I asked for gait and he just went into a bumpy trot, so I slowed him down right away. I repeated this a few times with the same result so I tried something different. I asked him to walk faster and faster before I asked for the gait. This had better success. I found, through trial and error, that Blaze was more likely to pace or gait if he was walking fairly quickly, but not as fast as he could go. If I got it just right, he would go into kind of a stepping pace or gait. If I did not have him quite ready, he would trot. So, in about an hour, this horse went from always doing a very bumpy trot, to beginning to gait on a loose rein. This was all done stress free and without the horse getting hot and sweaty. My goal is to keep the horse relaxed and calm through the whole process while showing him what we are looking for. When a horse takes some nice steps in gait, I always drop the reins and praise them. By doing this, they begin to understand what I am asking of them. « For Sale: Great gaited trail horse! Hi Ivy, I know this is going to sound really dumb, but what do you mean by gait? It usually refers to the speed or rhythm of the horse’s pace when I hear it used, but that doesn’t seem to make sense in this case? It isn’t a dumb question. I guess, correctly, I should have said an even-4-beat gait. When most people refer to gaited horses they are talking about tennessee walkers, rocky mountains, foxtrotters, pasos, and so on. These horse are bred and trained to walk, gait, and canter (they do gallop). The gait should be smooth to sit. It should be a 4 beat gait like the walk, but much faster. Sometimes as fast as 20 miles per hour! Does that answer your question?